Caption slip reads: "Photographer: Swaim. Date: 1960-01-08. Reporter: Swaim. Assignment: Fire rescue. 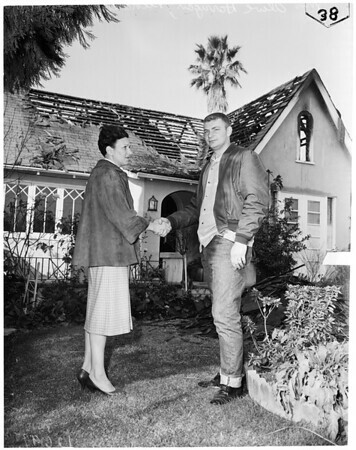 38: Mrs. Olive Harrigan, owner of small rest home which burned, thanking Richard P. Kain, reserve Deputy Sheriff in Altadena, for his part in saving four aged bedridden patients during fire".